For the past few days I've had the biggest craving for some Middle Eastern food. Hummus, falafel, tahini...I love them all. 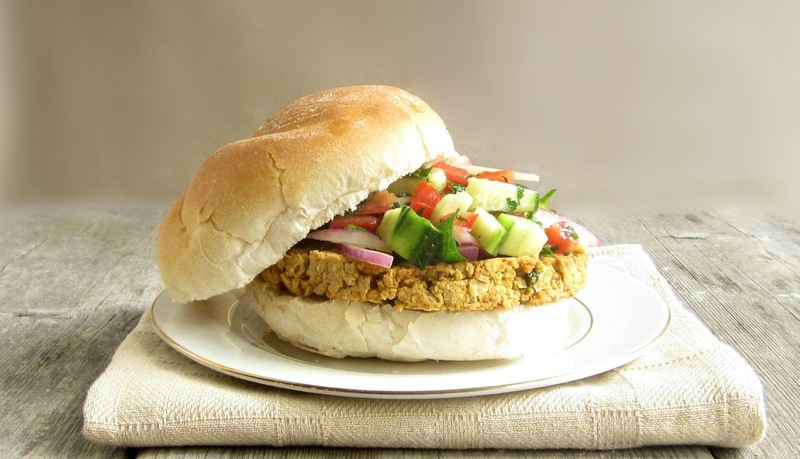 Chickpea burgers combine a lot of those flavors and are wonderful, versatile foods. Apart from the basic ingredients, you can customize them by adding in whatever you have on hand. Grated carrot, zucchini, peppers or mushrooms would all be great. The chickpeas are also loaded with protein and fiber and I just love it when healthy food is so delicious. 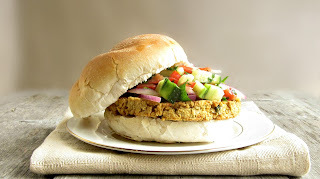 This time I went with a basic chickpea burger and some traditional Middle Eastern flavors. 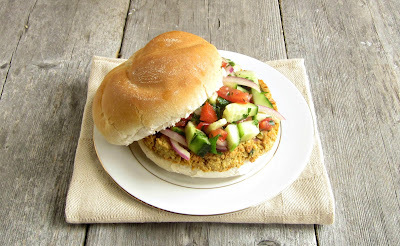 I used cumin in the patties and topped them with a classic Israeli salad which added so much freshness. But another huge personal favorite is curry powder in the burgers and a cucumber yogurt sauce on top. Delicious. Enjoy! Combine all the ingredients in a medium bowl and toss to combine. Place the chickpeas in a shallow bowl and mash with a potato masher or fork. It's OK to leave it slightly lumpy and textured. Add the tahini sauce, olive oil, breadcrumbs, onion, herbs and seasonings and mix to combine. Form into patties and place on a baking sheet lined with parchment paper. Bake in a pre-heated 400 degree oven for 20 minutes, flip and continue baking for an additional 20 minutes. You can make the burgers any size you like but I opted to make 2 hearty burgers from this mixture. Top with the salad or serve it as a side dish. * You can use prepared tahini sauce but I highly recommend making your own from this quick and simple recipe. I'm so excited to try this! I had a chickpea burger for the first time recently and loved it! 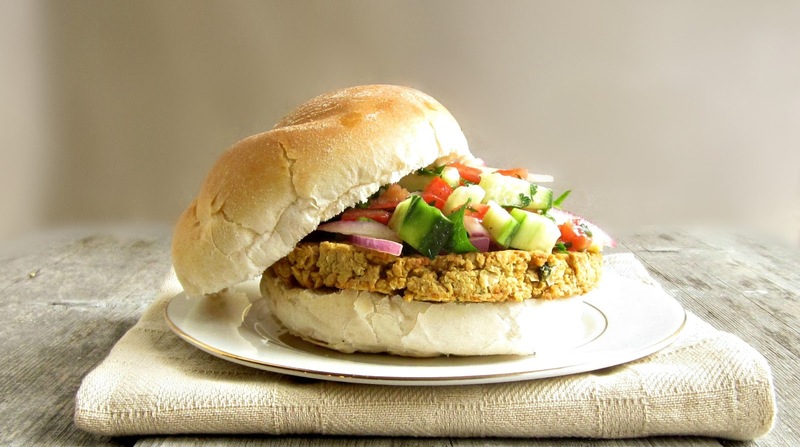 I've never heard of a chickpea burger and will enjoy trying it. I've had the salad many times but we call it by a different name and I would have never thought to have it on a burger. I'm trying this the next time we grill burgers - I think it will be great! Gosh, I just realized I have not been eating chickpeas much these days. I need to change that with this recipe. Yum! I fell in love with this burger at first sight. I love everyting about it. Yum! Yum. Great idea for summer grilling!